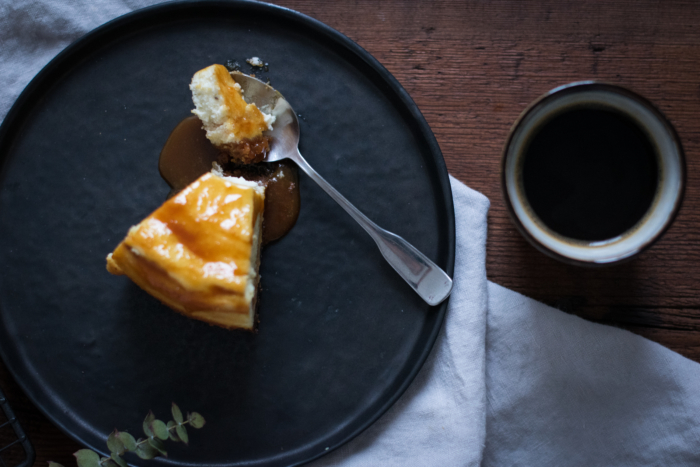 This apple, caramel & goat cheese cheesecake is as meltingly soft and frothy as you could wish, and I finally have the feeling that I mastered to get a perfectly baked one. The detail that changes everything: the foamy noise when your cake fork digs into the cheesecake batter. 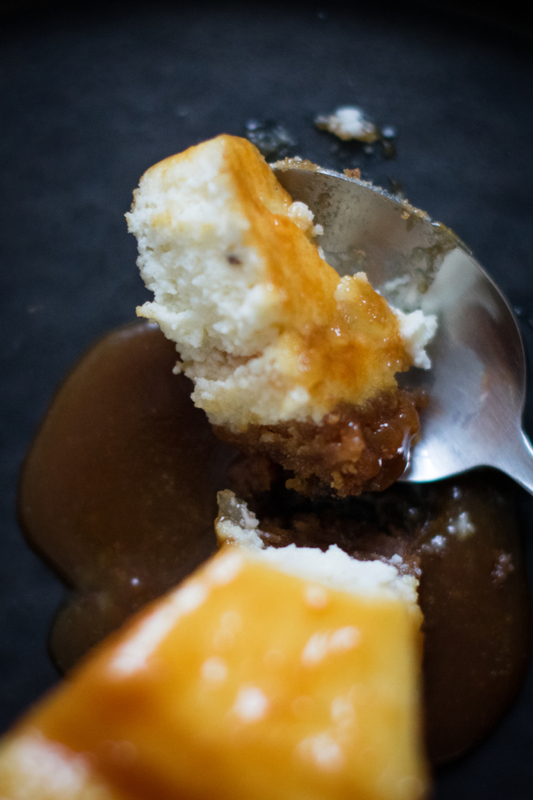 My most assiduous followers might have already got the fact that I’m a total fan of caramel sauce and salted caramel cream, which regularly sneaks into my blog recipes. 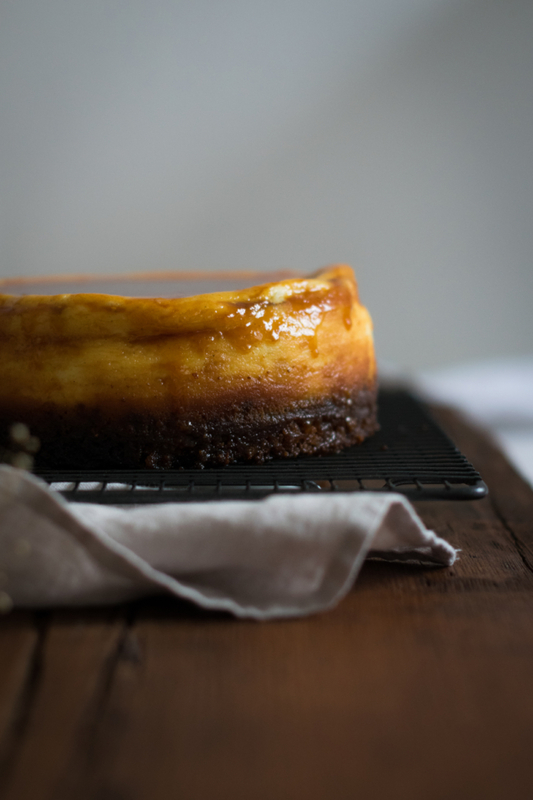 Obviously, the idea of this ultra soft cheesecake didn’t arrive to my recipe bucket list from nowhere! That’s the final result of long days of cheesecake obsession, following my last visit to Princess Cheesecake in Berlin, aka the place number one that you must include on your cheesecake bucket list every time you visit the city! The slice is not so cheap, but definitely generously sized. 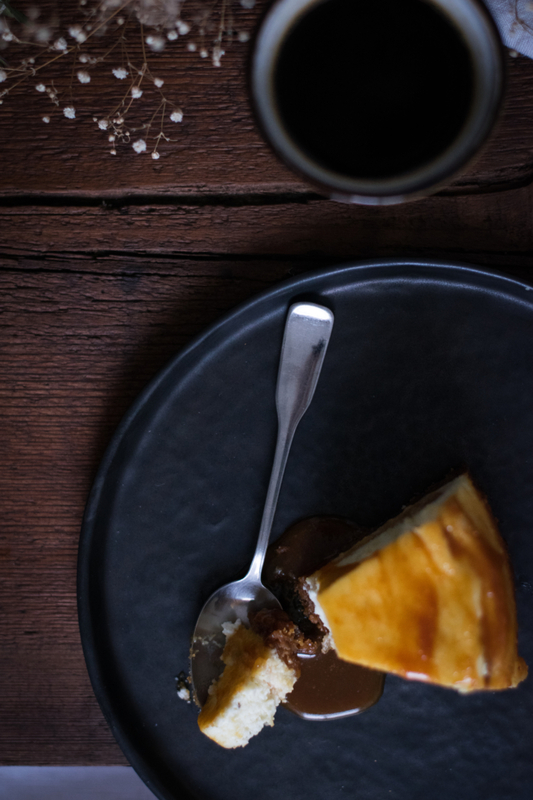 The taste associations start from a classic New-York cheesecake, via a caramel-coated version – does that remind you something? -, to more inventive ones including crunchy biscuit crumbs or passion fruit. 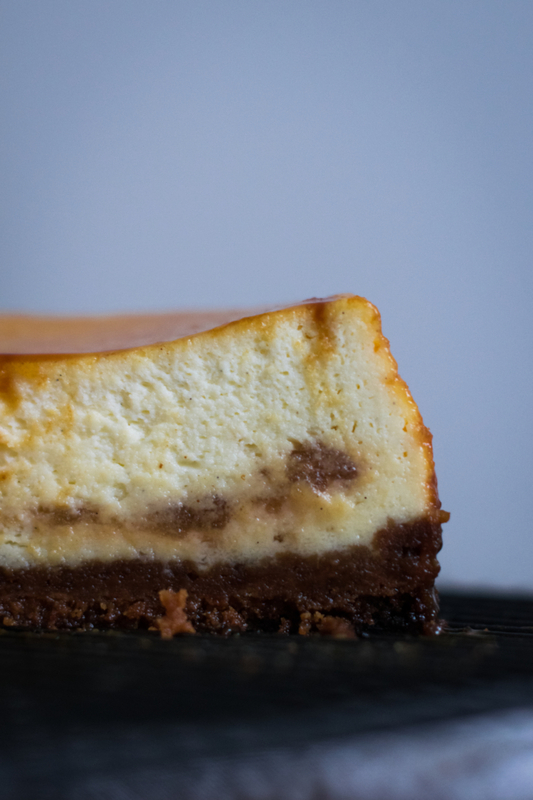 The texture of their cheesecakes is perfectly mastered and frothy in the mouth, which is way enough to seriously reconsider your own cheesecake game. 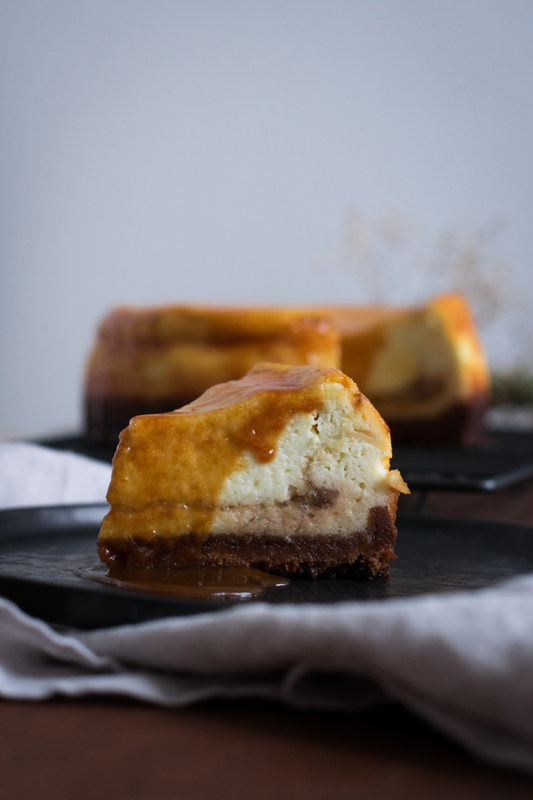 After this brief visit – followed by some massive food coma -, I thought again about this caramel-coated cheesecake – yep, that one definitely eyed me up – and motivated myself to finally make my first one since I’m living in Berlin, which I’ve actually never dared to make because of my grossly insanely too hot oven. 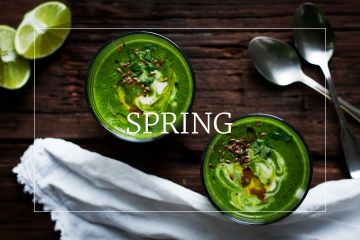 Another thing that you might have noticed if you’re coming on the blog regularly is the growing number of pictures illustrating my recipes since the last few months. 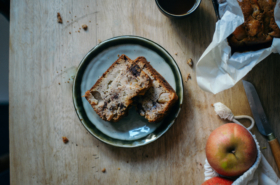 For the official explanation, I’m enjoying more and more shooting the recipe making process, highlighting raw ingredients, and telling a story through each picture. It requires way more time than just shooting the final result, indeed, as well as more technical skills to properly shoot them – which was clearly not my thing when I started this blog. For the unofficial explanation, this constantly growing number is justified by the fact that I’m simply not able to choose between the dozens of pictures to classify, and then between the 10 or 15 final ones that are good looking enough to be published. 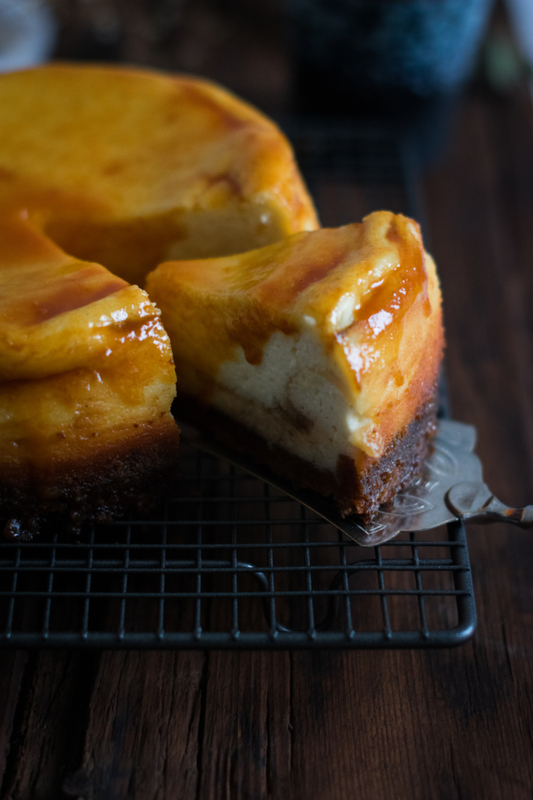 The salted caramel texture on that one looks insane, but the light on this one is better, hmm but somehow this third one gives a better overview of the cheesecake… decisions decisions. That way, I can easily spend 10 more minutes overthinking about which pictures should I rather choose, always having a slight heartache for the less convincing ones that I have to take from the list…tough life! 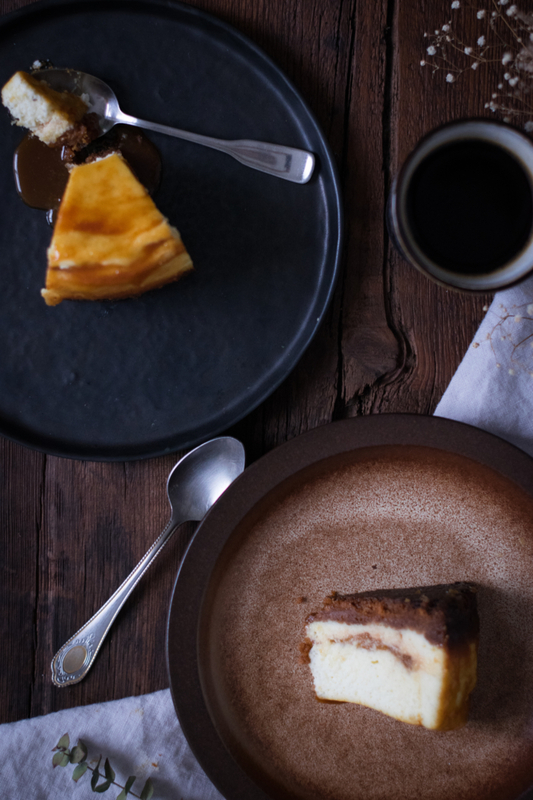 Adding some soft goat cheese to the cheesecake batter brings a sour touch that lift the rest and fits perfectly with caramel and apples. 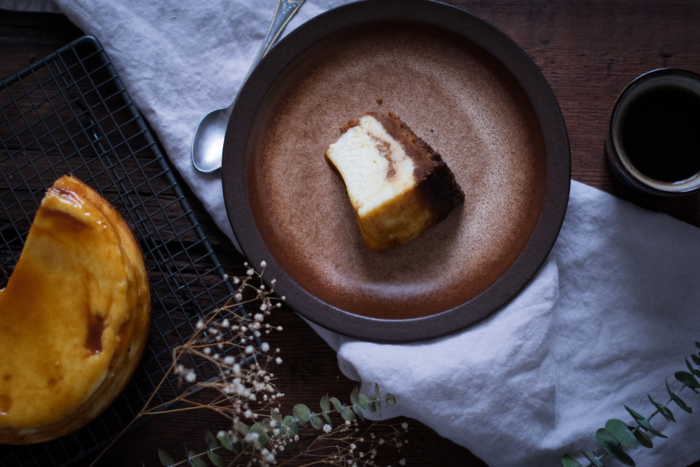 For people who don’t like sweet & sour dishes, no worries to have here as this apple, caramel and goat cheese cheesecake is still gonna keep 100% of its softness and sweetness. 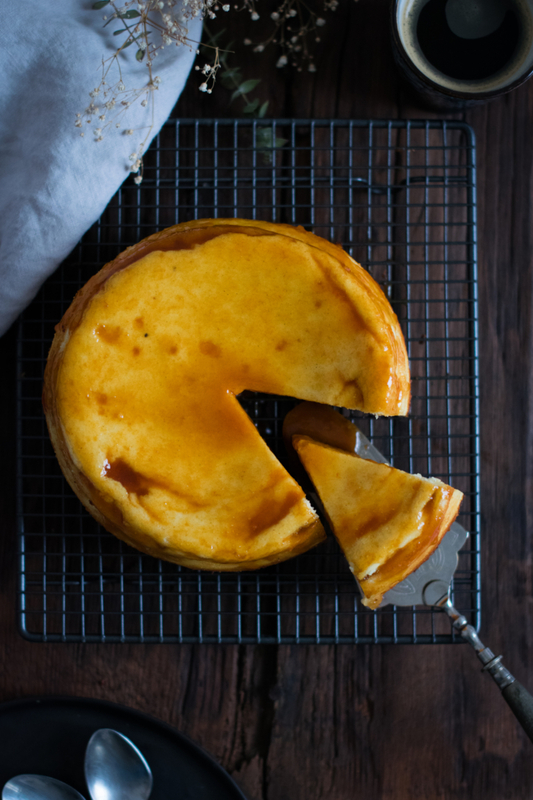 About the baking, I would recommend you to cover the cheesecake with an aluminium foil before to put in oven, so that it will keep some moisture during the baking process and not get burned if your oven is used to heat too much – I’m talking from experience, as mine is used to roast every single cake, tart, and anything getting in it. 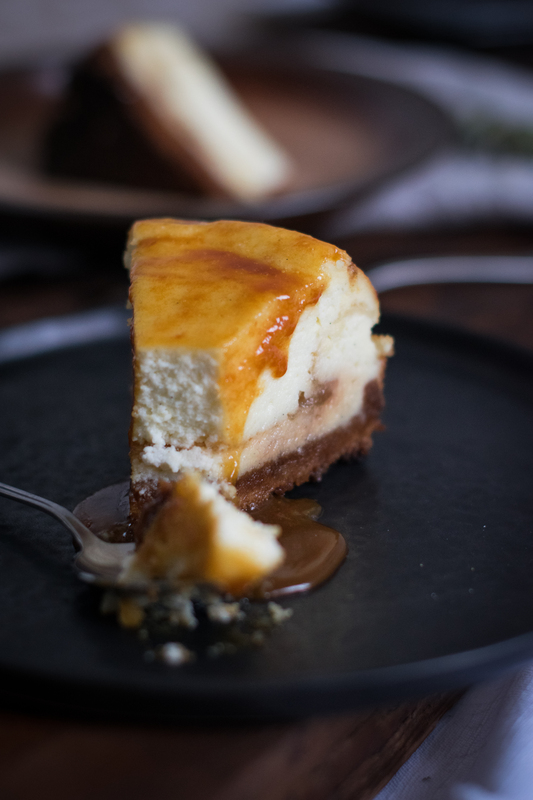 About the salted caramel sauce, you can either coat the goat cheese cheesecake with and let it rest for a few hours in fridge, or let sit the cheesecake in fridge before, then coating with warm caramel before serving. All depends about how you prefer your caramel: as a runny caramel sauce or a soft caramel cream having some structure. 1. 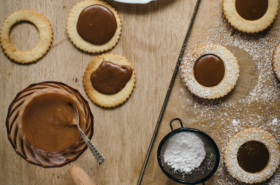 Prepare the crust: thinly crumble sablés or shortbread biscuits. Melt butter, then add it to the biscuits with sugar. Stir well, and add the mixture in a 20cm ø cheesecake mould. Press well with the back of a spoon and put in fridge for about 20 minutes. 2. Preheat oven to 180C. Take the crust from fridge, then bake in oven for 18 minutes. When ready, let cool aside. 3. Prepare the apple insert: in a small pan, heat slowly apple jam and apple juice together. Once lukewarm, add gelatine and stir well. Let rest in fridge for 1 or 2h. 4. Prepare the cheese filling: preheat oven to 150C. In a salad bowl, whisk cream cheese, goat cheese, thick cream, sugar, corn starch, lemon juice, rhum and vanilla beans together. Add eggs one by one while keeping beating. When the batter is homogeneous, pour half of it on the crust. Spread on it the apple insert (in center), while trying to let a space of 3cm without anything around. Pour the remaining cheese batter on it. 5. Cover the mould with an aluminium foil - that's optional, but I warmly recommend it if your oven is heating too much, then the cheesecake won't bake too much and will stay a bit moist- and bake in oven for 1h10 at 150C. 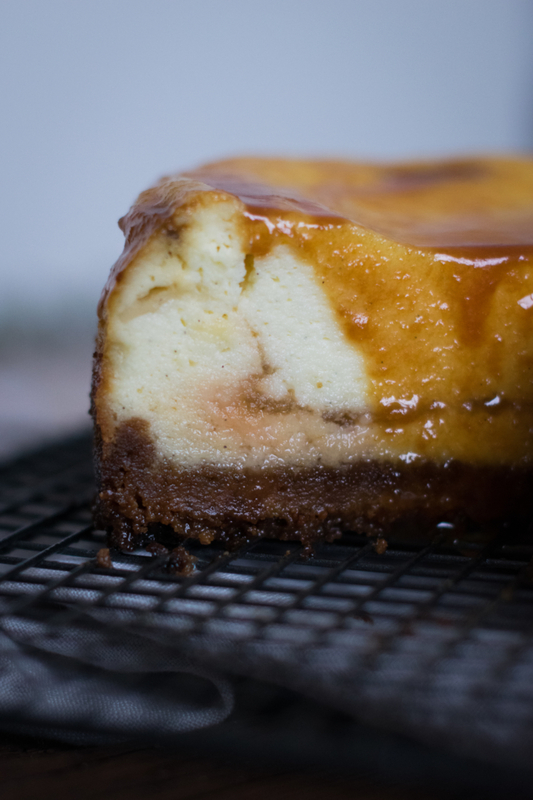 The center of the cheesecake should still be a bit trembling when you turn off oven. Let the cheesecake cool in oven for about 30 minutes more, then put it in fridge during the caramel preparation. 6. 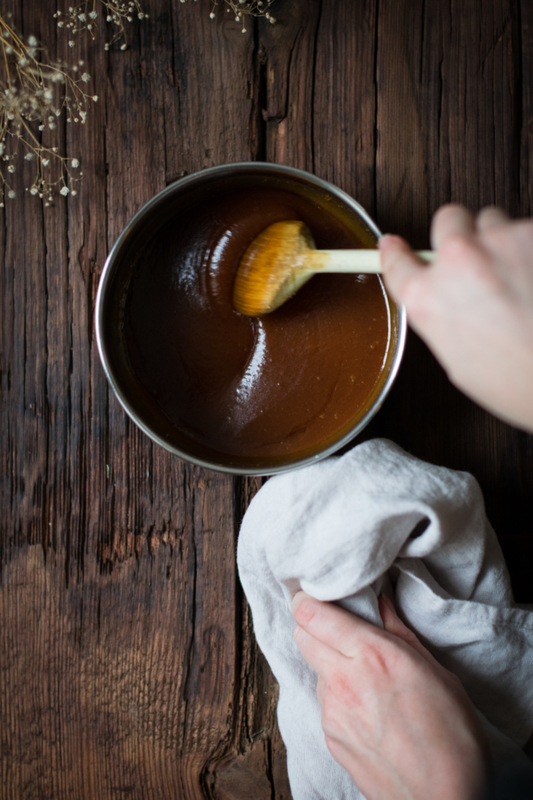 Prepare caramel sauce: in a pan on low heat, slowly melt sugar. 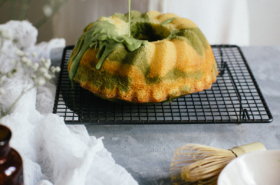 When it starts to color and turn into caramel, add a drizzle of lemon juice to avoid burning. Add single cream and stir well until you get a homogeneous sauce. Turn off fire, then add butter cut in pieces and stir until complete incorporation. Let cool for a few minutes. 7. 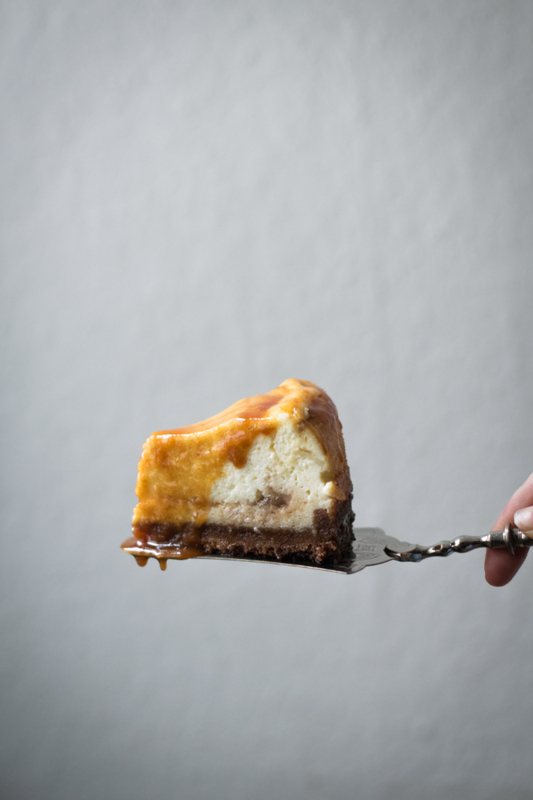 Pour caramel sauce on the cold cheesecake. You can either let sit in fridge for a few more hours, or serve directly, when caramel is still runny.